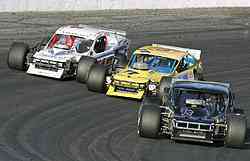 If you take two young and hungry drivers with a chance to win a very prestigious NASCAR Whelen Modified Tour race that has 30 years of history behind it and you throw them into that race with less than 10 laps to go, it could be the recipe for a great finish. Or it could be the recipe for disaster. That is exactly what happened when Donny Lia and Doug Coby mixed it up with a handful of laps left in Sunday’s Sunoco 300 at Thompson International Speedway (CT). 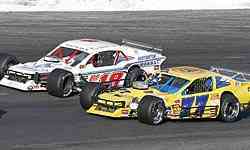 Coby and Lia were racing for second place within a stone’s throw of race leader, and eventual winner, Ted Christopher. They raced hard to beat each other. Maybe too hard according to one of the drivers involved and maybe just right considering what was at stake, according to the other. While battling for position inside of 10 laps to go, Coby took the bottom lane of the racetrack while Lia stayed in the top groove. Coby slid up the track a few times and Lia took evasive action a few times. One final time, contact was made between the two cars and Lia was not happy about it. Was it hard racing at the end of the race or something else? Both drivers have differing opinions. Coby claims that what he was doing was just hard racing and nothing more. As the field went by under caution, Lia told Speed51.com that he was moved back into second place by NASCAR. It turned out that Coby’s pass for position occurred after the caution flag actually waved. As Lia moved up to take the correct position on the restart, he turned right into Coby’s #77. Lia claims that his intent was only to nudge Coby to show disapproval for what happened on the previous lap. 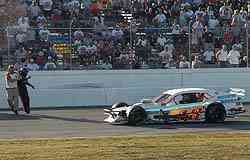 However, the contact was hard enough to turn Coby into the frontstretch wall in plain view of a packed grandstand. The right front corner of the #77 was heavily damaged and Coby could not finish the event and, intention or not, it was because of the action taken by Lia. After exiting his car, Coby walked towards the car of Lia, which was circling the track under caution. 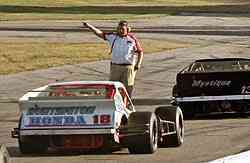 He was restrained by a NASCAR official before reaching Lia’s car. Meanwhile, NASCAR immediately parked Lia. After the race, he was also given a time penalty that moved him to the 20th finishing position, one spot behind Coby. Coby was understandably upset after Speed51.com caught up with him following the conclusion of the race. After all, he saw the possibility of winning his first career NASCAR Whelen Modified Tour event in one of the season’s toughest events turn into a 19th-place finish with a bent racecar. It also appears that the problem between Lia and Coby might have been simmering for awhile. Lia issued a statement on Monday evening after the race apologizing for the incident and giving his side of the story. [Click here for more]. Speed51.com attempted to contact Coby for a reaction to Lia’s comments, but we were not successful. However, given Coby’s thoughts immediately after the race, any apology might be too little and too late. After the dust settled, there were no winners in this incident. Both drivers saw their chances to win would have been the biggest race of their careers so far vanish. The #77 team had to repair a racecar wrecked unnecessarily and fans were robbed of the chance to see two of the brightest young stars in Modified racing take on a master like Ted Christopher for a race victory. It’s likely that these two drivers will have more close battles in the future and after the events of Thompson, you can bet that the results will be much different when that happens. Until then, both drivers are left to wonder what could have been – at least until the next race.